Jens Dahle and James Eberhart are both prisoners in the Confederate prison at Salisbury, North Carolina. James kept a diary of his imprisonment which closely parallels that of Jens Dahle. Finally the day of freedom arrives! The stories of James and Jens diverge on February 22. James, one of 2822 prisoners and 48 citizens were well enough to walk out. As much as can be pieced together, Jens was loaded onto a train and taken to Parole Camp in Annapolis where he arrived on 3 March 1865, a trip of about 400 miles. It is valuable to know what happens to James, our diarist, until we pick up the story of Jens in a subsequent blog posting. Arrived at Greensboro. All hungry. after dark they gave us molasses & corn meal to eat. Slept in wood all night with a good fire. Got on town in afternoon and arrived at Raleigh about 10 pm. encamped in open field. Nothing to eat. I cannot even imagine the euphoria….and the sense of being safe, a quality when it is taken away permeates your psyche in such a negative way. Think of his first time in a bed or by a fire or having a cup of stew….all big events that others take for granted but James would imbue with the qualities most normally associated with miracles. 1 James Eberhart, Diary, 1864-1865. 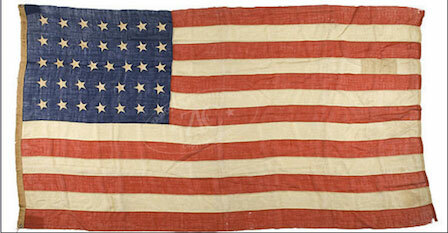 2 36 Star Flag, “National Treasures: Union Civil War Flags from 1861-1865”, digital image, Zaricor Flag Collection (http://www.flagcollection.com : accessed 1 January 2015), ZFC3087. 3 James Eberhart, Diary, 1864-1865. This entry was posted in Education and tagged Annapolis Parole Camp, Civil War, James Eberhart, Jens Dahle, Salisbury prison. Well, Jens’s story will end soon and my posts on him will stop. So, you will have to “remind yourself”! 🙂 have a great day, Kathy. It’s beautiful here in Seattle. Spring has sprung–flowers are blooming everywhere. Fascinating stuff! It sends a chill through me to know my great-grandfather’s story as he lived it! Thank you again for these posts. My brothers and I are grateful.